This is the timeline used by the JamCat Home Academy. 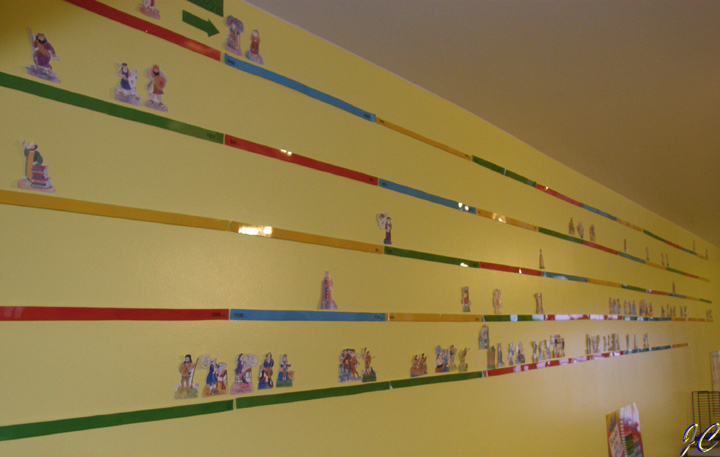 We use the Konos century lines cut into strips and characters from four sets: Timeline Volume 1, Timeline Volume 2, Timeline Volume 3 and Bible Timeline. 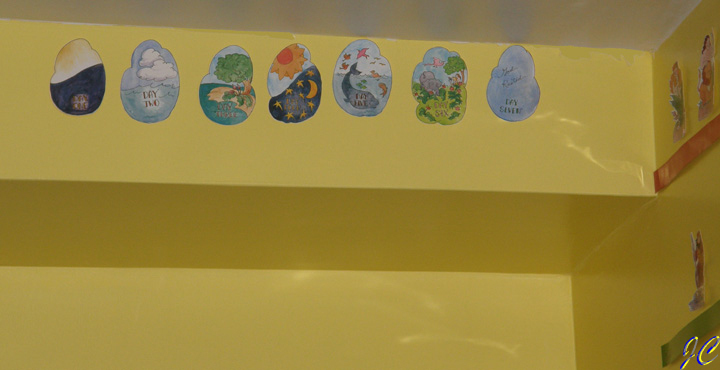 The timeline is in our playroom because that's where we have the most wall space. We originally had the century lines on foamcore which we used to make a border around the top of the room. It looked a bit like a wallpaper border with century lines and figures on them. Unfortunately, the foamcore would not stay on the wall and we literally lost time! We got rid of the foamcore and stuck the century lines directly to the wall. We did not follow the pattern recommended by Konos. Instead, we made five lines on the wall. The top two lines are BC and the other three lines are AD. This is a constant work in progress. We have more figures in the later AD years because we've been focusing on United States history. Also, the kids never want to take a figure down so it's cramped in places! 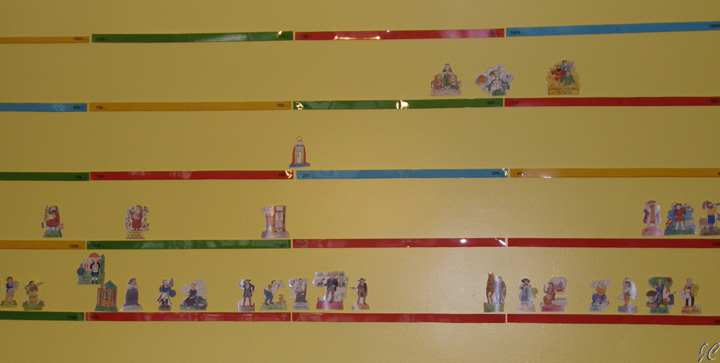 The kids want to make groupings outside of the timeline, such as the 12 apostles or the Christmas nativity. We've already done this with the days of creation. We've considered making our own figures but haven't tried it yet. 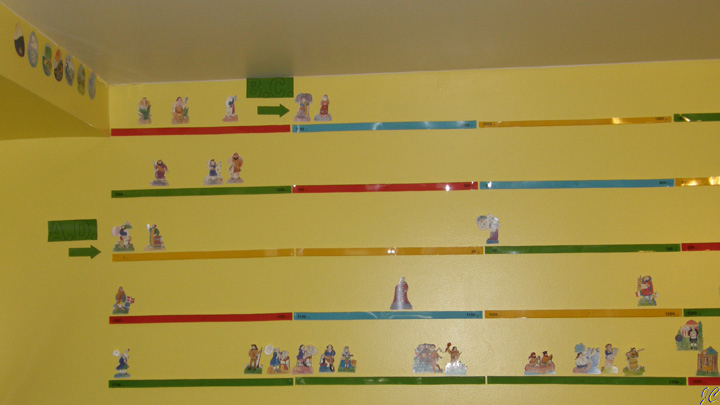 Timelines are important to help all of us understand the scope of history. We've tried using books but it doesn't work as well flipping through pages. The wall lets us see history at a glance. We have little moments of realization: Sacagawea and Francis Scott Key lived at the same time. Go a bit down the timeline and we see Ivan Pavlov and Wyatt Earp were born a year apart from each other. Of course these people didn't interact with each other but it's good to remember everything that was happening in a particular time. We tend to study people in their historical context so it's easy to think of each time period happening independently of the rest of the world. While Wyatt Earp was becoming an American legend, Thomas Edison and Ivan Pavlov were adding to our collective science knowledge. This may seem obvious but the timeline is a great visual reminder. Below are some pictures of our timeline. It isn't fancy but it keeps the time periods relatively in order. We are constantly adding to it - pictures will be updated when there's been a significant change.